It seems after stepping up to Android Oreo Sony has become punctual in delivering firmware updates. As you read, the November security patch for Xperia XZ1 Compact is rolling live. This is an important update as it fixes the camera distortion issue. It also upgrades the security level of the device to that of November 1, 2017. The current update brings the firmware build number 47.1.A.5.51 for Xperia XZ1 Compact. The update is based on Android 8.0 Oreo. The update is rolling over as OTA in batches. So, it might take some time to drop on your device. Alternatively, users can also download the firmware files directly from Sony firmware repository. We have explained the steps in detail on how to download and install the latest firmware. 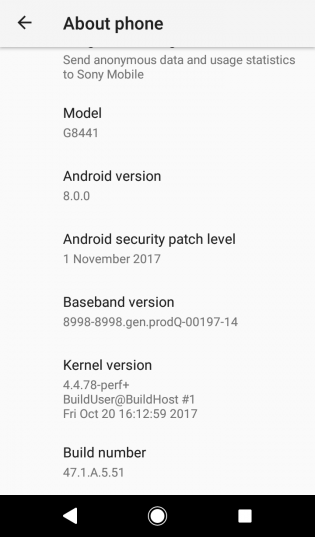 Here is a screenshot of Xperia XZ1 Compact Now Updated to November 2017 security patch. As we mentioned earlier, you can download the latest firmware bearing build number 47.1.A.5.51. You have to use the XperiFirm Tool for this purpose. it will display a list of available Sony Xperia devices. it will display the latest firmware for that region. A Firmware Details pop-up will show. Click Download to grab your required firmware file. Below is a screenshot of the process. How To Install the Xperia XZ1 Compact Firmware Update? You have to use another software called FlashTool to install the firmware for Xperia XZ1 Compact. Now follow the link below. It has a detailed illustrative explanation on how to flash a firmware on Sony device using Flashtool. Install Latest 47.1.A.5.51 firmware for Xperia XZ1 Compact. Therefore, this update is an icing on the cake. Android O with latest security patch and now the camera issue is fixed. So, catch the firmware ASAP and update your Xperia XZ1 Compact. Keep following AndroidSage for all latest firmware updates on Xperia devices.